Close to all that the area has to offer, The Links At Gettysburg offers a bustling Main Street USA experience, surrounded by 340 acres of gorgeous scenery. The Links At Gettysburg is located in Gettysburg, Pennsylvania just one hour from Philadelphia, Washington DC and Baltimore. This gorgeous new community features custom build lots, a 4.5 rated golf course, playground, outdoor swimming pool, tennis courts, basketball courts, exercise classes and more. The town of Gettysburg provides the perfect combination of history and up and coming. From battlefield tours to award winning restaurants, Gettysburg has it all. 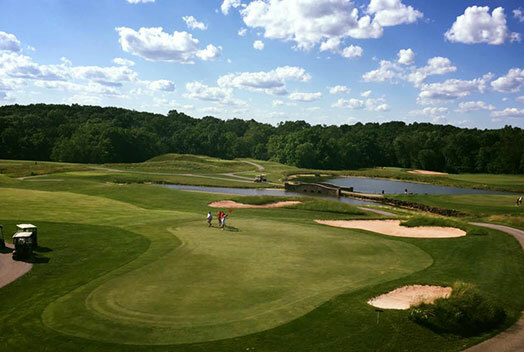 The golf course features expansive lakes, waterfalls and red clay cliffs. It provides an excellent opportunity for both experienced and inexperienced golfers. The pro shop includes an outdoor patio and outdoor grill overlooking the course. The Links At Gettysburg provides an honest, low maintenance lifestyle. There are four home styles available. Whether you are looking to buy a single story condo or a single family home, there’s something for everyone at The Links At Gettysburg. New homes are specially designed based on each buyer’s individual preferences. They feature unique custom build lots, handpicked architect and builder teams, individually selected lot and floor plans, exterior home maintenance options, award-winning luxury real estate builders and a trusted partnership with Energy Star. All of this and more is available at The Links At Gettysburg. Residents at The Links At Gettysburg can take advantage of rolling hills, lakes, creeks, woodlands, red clay cliffs and the Catoctin Mountains. Those wishing to tour battlefields, stroll through historic Gettysburg, enjoy award-winning farmhouse restaurants and shop in a small town village can do so just fifteen minutes from the community. The Links At Gettysburg offers the best of small town living with modern amenities close by. Prime Building Advantage offers sales and marketing services to the real estate industry. Our process helps our clients advance their brand and reach potential residents in new and meaningful ways. Please contact us for more information about The Links At Gettysburg.